Annalyse and Mike's destination wedding in the Riviera Maya, Mexico. Annelyse and Mike met online shortly after she moved to Chicago in 2015. Mike’s proposal was certainly a memorable one. Mike surprised Annelyse by singing her a song on one of the trademark bridges at the Lincoln Park Zoo. After she said yes, they met their friends and family for dinner at The Monkey’s Paw, the restaurant where they met on their first date. Mike and Annelyse decided to have a destination wedding in order to bring both of their families- hers from the Southwest and his from the Midwest- together to a central location. 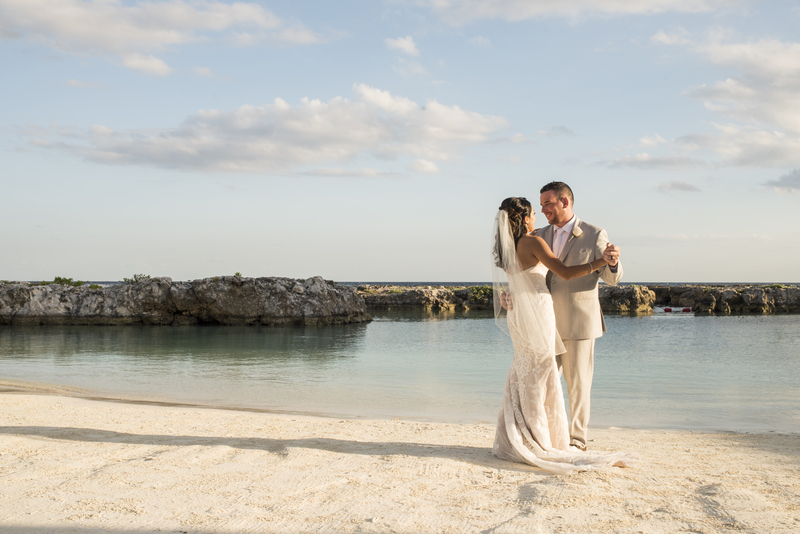 Together with their Destify agent, Brandi, Mike and Annelyse chose the beautiful location of Riviera Maya, Mexico. More specifically they chose the Hard Rock Spa and Resort because it was a popular and reputable company. They liked that the resort had something to offer both adults and families with children. They hoped that having a destination wedding, instead of a local wedding, would allow their friends and families to spend a longer period of time together and have fun relaxing together. Annelyse said, “Instead of people coming in for a day or two, they were able to stay for a longer amount of time- some up to a week.” Although most of the planning went smoothly, they noted that there was some miscommunication when first working with the wedding department. However, as their wedding date approached communication became more frequent and less stressful. Their wedding took place on a Friday but since many of their guests arrived a day or two before, they decided to host a welcome cocktail reception on Thursday evening. At the cocktail reception, guests were served hors-d’oeuvres, enjoyed music and speeches and were able to get a preview of what the weekend would look like. Mike and Annelyse especially loved the reception because “It was a great way to greet and thank everyone for coming.” Doing this on beforehand helped them to have more time to enjoy their reception the next night. The morning of the wedding, the ladies enjoyed a breakfast buffet and champagne in their own bridal suite. The photographer was able to meet them there to take some photos as well as meet with the groom and his groomsmen to get some photos on their rooftop balcony. The ceremony began around 3 o’clock and was held at the Tulum Gazebo on the adults-only side of the resort overlooking the ocean. Between the ceremony and reception, guests were able to grab a drink while Mike and Annelyse took their couples photos. Their reception was held at the Starlight Terrace. Guests enjoyed a buffet dinner, open bar, and the DJ, who was a friend of the couples from back home in Chicago. The couple loves looking back at photos of their reception- especially those of their first dance where the sun is setting just behind them. Their wedding guests decided to keep the party going the next day by enjoying some pool volleyball and cocktails at the main pool. Mike and Annelyse agreed that their wedding weekend went off without a hitch. Annelyse recommends doing your research beforehand because unlike a typical local wedding, much of the planning for a destination wedding happens 2 -3 months before the wedding date. She suggests that you vocalize what you truly want and be sure that the decisions made are those you feel good about. Mike and Annelyse took advantage of the “Sound Check” opportunity that Hard Rock offers. This allowed them to visit the resort before their date to see potential venues, meet with a wedding office staff member and make some in-person decisions. The coordinator was on top of everything, she was easily available the entire time we were there.